JV | Themeaker – Promotional Tools, Bonuses & More! 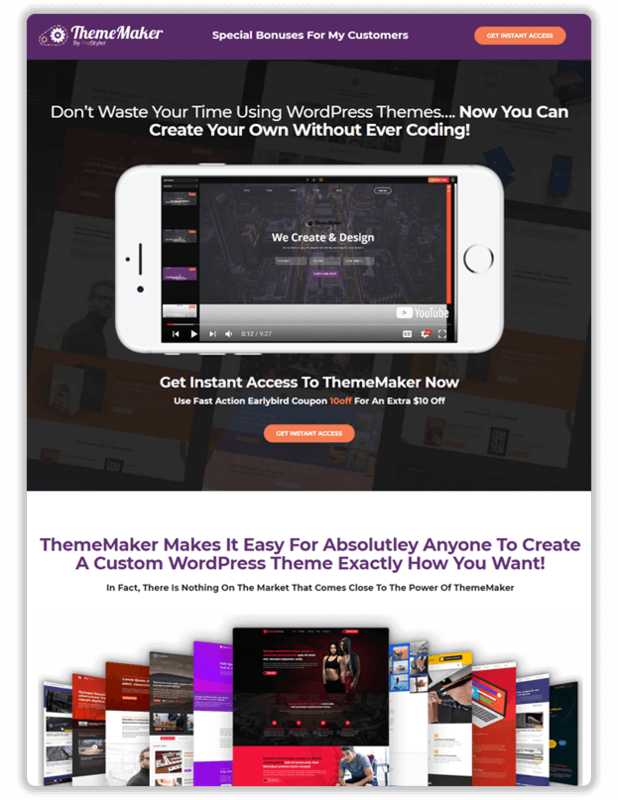 ThemeMaker Lets Your Customers Easily Build There Very Own Custom WordPress Themes! ThemeMaker allows your customers to quickly and easily build there own unique WordPress Theme without ever having to mess about with code. They can build everything from bespoke blogs right up to full blown custom membership sites with the plugins they love (DAP, wishlist, etc), e-commerce stores & more! If you can imagine it, you can build it with ThemeMaker without ever hiring a coder! Let Me Show You ThemeMaker! We Have Over 150 – Five Star Reviews, From Customers Who Have Been Using Our Products For Years! 5 x Live Sessions With Me Building Custom Sites Like Members Area/ E-Comm Stores etc..
so check it out – it’s well worth a look. This is a great selling point if you are designing for clients – you can make up to 5 times more profit than conventional themes as people pay way more for bespoke designs. It’s on launch pricing right now and you can get an extra $10 off with coupon code 10off & well worth checking out. Have the code? Create your bonus page below. You can use these images, your customers will only be able to get these bonuses from you, they will not be on the sales page. I would also make a thank you page and place the bonuses on there and link to the upsell to get more sales. Please always adhere to these FTC guidelines when promoting our products. You must agree to our affiliate agreement before promoting ThemeMaker. In addition, you are PROHIBITED FROM USING THE FOLLOWING PROMOTIONAL METHODS if approved for this affiliate program. Doing so may result in you being terminated from the affiliate program and forfeiting any outstanding commissions. 1. Sending cheap traffic sources such as Adfly, popovers/unders. 2. Spamming, offering a bribe or cash rebates to people who buy through your affiliate link. 3. Using negative words such as ‘scam’ or ‘fake’ in your promotional campaign. 4. Do not misrepresent our product/offer and follow any endorsement rules and regulations that are applicable both in the country where you are based and in the countries from which you are sending website traffic or advertising in.